Betbtc.io is a new casino that launched in 2019. However they have already shown their true colors and there are reports from players not getting paid large sums of money. 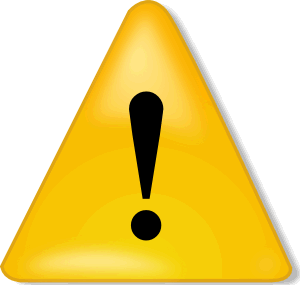 We encourage all players to avoid this casino and find a more reputable site to play at. Betbtc.io casino is also unlicensed which means they can basically do whatever they want at the end of the day and have to answer to nobody. 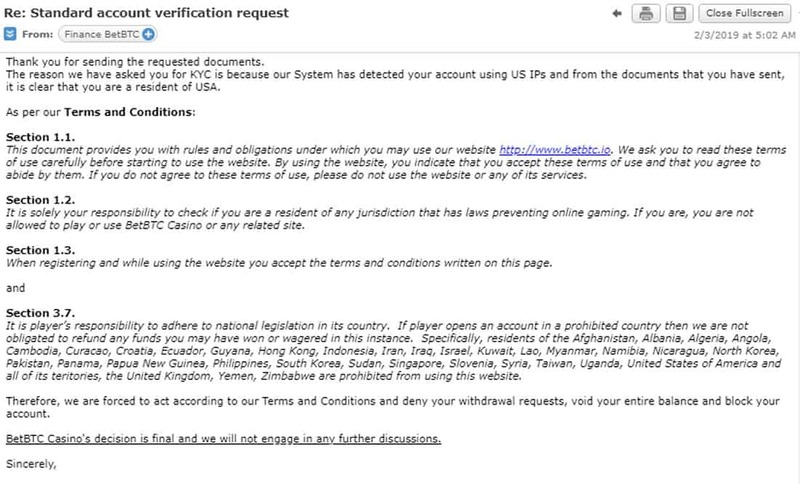 It’s only sites like ours that feel it’s our duty to inform the gambling community as a whole when a casino is rogue. We have been in contact with a high roller player who signed up with this casino. This review will share what the player experienced step by step and highlight the unethical behavior of this site revealing why we feel Betbtc.io is a rogue casino. 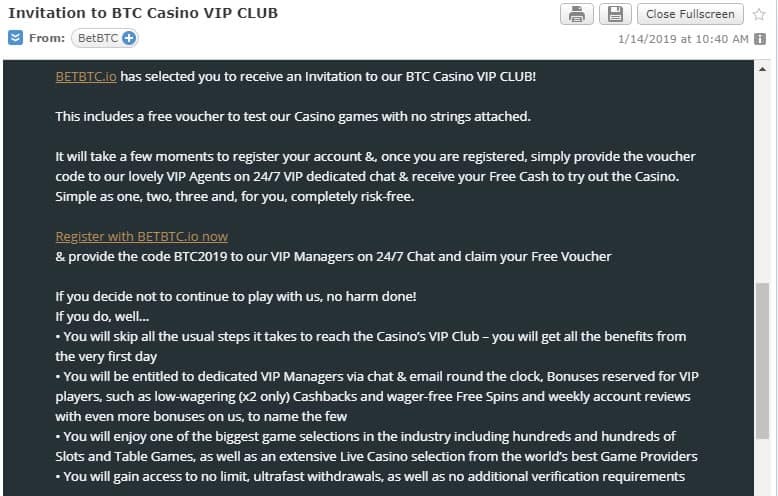 One player reports being lured in with an email invitation to signup which stated the player would have instant VIP status which included access to higher bonuses, fast no limit withdrawals, and no verification documents. This is not all that uncommon if a casino knows a particular player is a high roller. So the player decided to sign up with Betbtc.io. 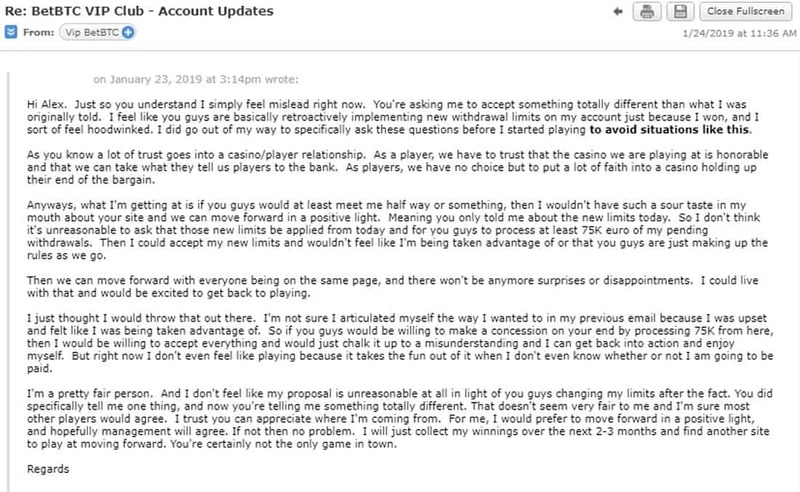 Even though the invitation stated there would be no limits on withdrawals, the player thought it would be best to clarify this with management anyway. So the player contacted live chat to confirm, and live chat stated they would have the VIP department reply via email about withdrawal limits. Below is their reply. This player then deposited to test the casino out and lost their first few deposits. The next day VIP department starting lavishing the player with generous cashback bonuses and such on their losses. So the player decided since they were being well looked after, that they would make another deposit. This time the player was lucky and ended up winning over 10btc. The player was paid in full with no problems at all, no verification documents required or anything. So since the casino had demonstrated that they were honoring exactly what the VIP invitation stated, the player decided this was a site they might play at frequently. So the player made another deposit and their luck continued in a big way. The player ended up winning over 180K Euro when all was said and done. However this is when Betbtc.io's true colors came out. First Betbtc.io stated that they had to request game logs from the software provider due to the big wins. This might not be all that uncommon on big wins, but it was a sign to the player that something fishy might be going on and that the casino might be implementing stall tactics in hopes that the player would lose back all the winnings. After several days had passed and the payouts haven't been processed, the player followed up with their finance department. Then BetBTC.io implemented their next stall tactic. They retroactively changed the player's withdrawal limits after they had clearly told the player there would be no limits. We've seen this many times over the years through shady casinos and it's just a move to stall the player in hopes that the player loses back all their winnings, which many players do. 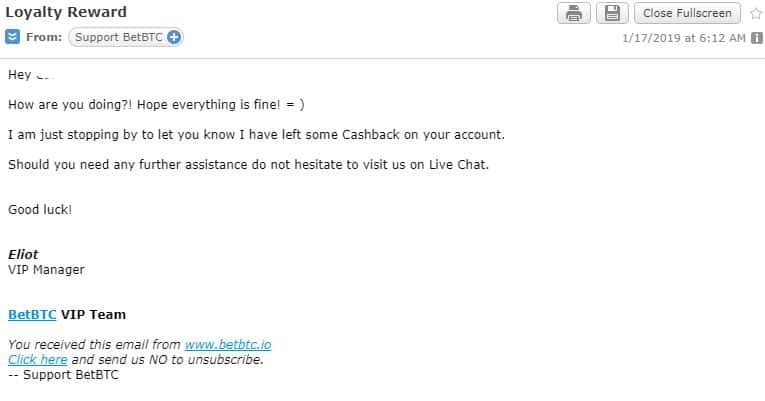 But it was becoming very apparent to the player that Betbtc.io was in fact stalling, not to mention lying and changing the withdrawal terms after they specifically told the player that he/she wouldn’t have any withdrawal limits. The player explained to us that this is exactly why they inquired about withdrawal limits in the first place, to avoid situations like this. But when you are dealing with a rogue casino, it doesn't matter what they've told you initially. At the end of the day, if they want to steal from you, they do exactly that. 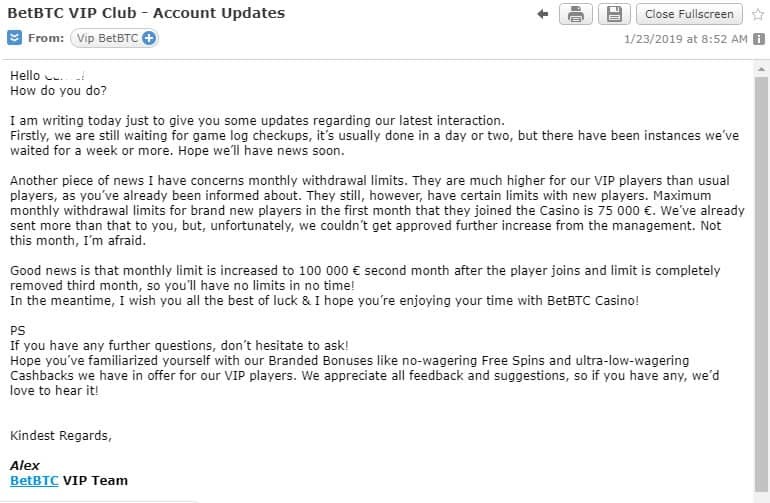 Below is the player's reply to BetBTC.io after they changed the withdrawal limits. 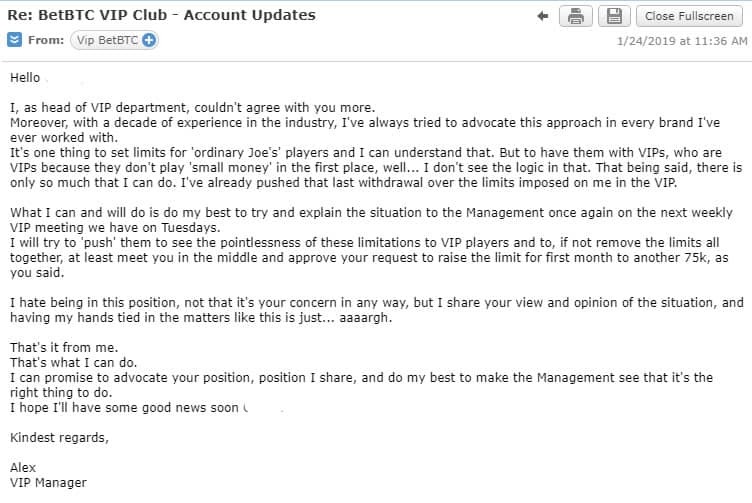 Below is the reply from Alex in the VIP department. This seemed like a very reasonable reply and the player held out some hope that BetBTC.io would act ethically and pay the player their winnings. Now after 2 weeks of stalling and numerous back and forths between the player and the casino, BetBTC.io requested verification documents from the player. 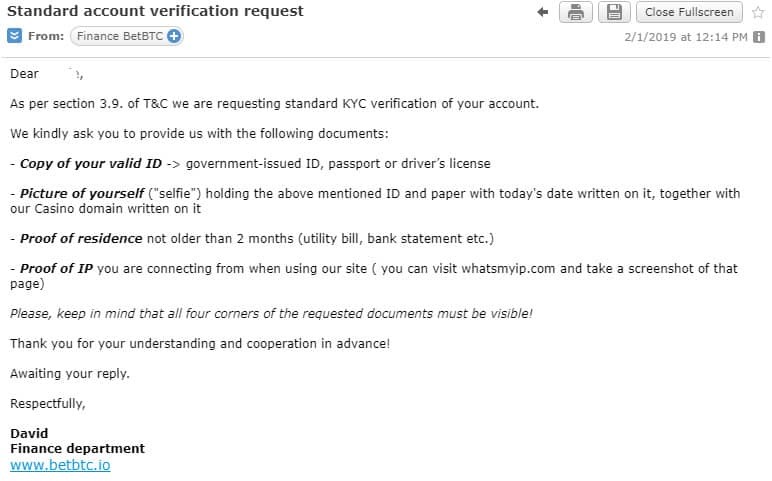 Keep in mind this is after the invitation email specifically stated there would be no verification documents needed, no withdrawal limits, etc. Seeing the picture yet? Again the player is a high roller and most casinos will turn a blind eye to things such as verification documents and such because they want the player's action. We feel like Betbtc.io is definitely a rogue casino that should be avoided. While we don't dispute that the player is from the US, we also understand how things work on the high roller side of the industry and how casinos will look the other way when it comes to things like a player residing in a jurisdiction that doesn't allow gambling. Here, we feel like Betbtc.io obviously knew this player resided in the United States of America from the very first day, yet they said and did nothing because they wanted the player's action, i.e. money. If they had any issue with the player having a USA IP address, it would have come up on the first payout. So there's no denying that they knew exactly where the player was from. Furthermore, if we've seen this movie once, we've seen it a million times. Meaning in today's day and age of technology, we know how easy it is to block/restrict access from a particular country such as the United States. This is what reputable casinos with integrity do when they don't allow a player from a specific region. However, most rogue casinos take advantage of this and instead do not block any traffic from prohibited regions and use it as a gig to steal from players. They actually want to do business with USA players but only if they win big so the casino will use their terms as a scapegoat not to pay. This gig is actually one of the biggest scams in online gambling right now used by unethical and rogue casinos. So based on all the correspondence that was provided to us by the player, Betbtc.io has clearly demonstrated that they will use stall tactics, lie by changing the withdrawal terms, and ultimately just decide to steal from the player after establishing a clear understanding between the two parties. 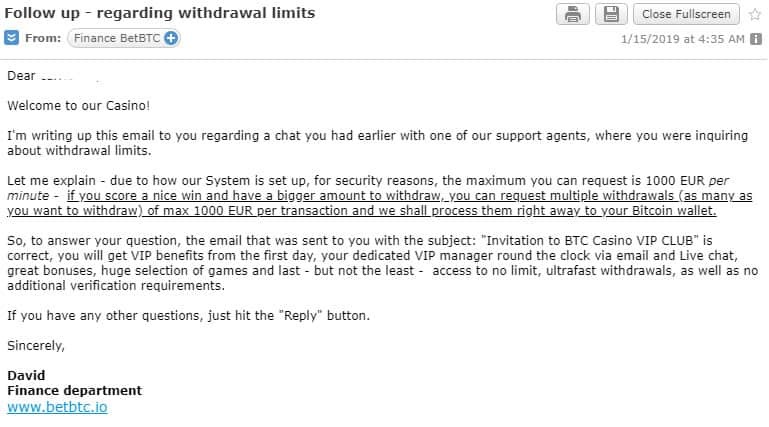 If they had honored what the VIP invitation stated, the player would have never see withdrawal limits or have been required to send in the verification documents which again, is pretty common when there is a high roller involved - Especially when it comes to using bitcoin. So either they are blatant liars and thieves, or they couldn't cover the payout. Either way, they are not a casino that anyone should be playing at. In our opinion, they are just liars and blatant crooks that reflect the worst that the industry has to offer. I only continued playing because I thought I had an understanding with the casino and that they would let me play from the United States and honor what they told me in my original VIP invitation email. After all they had already processed over 10btc in withdrawals and it's commonplace for casinos to turn a blind eye to these sort of things when dealing with a high roller. Of course they knew I was a USA player from day 1. 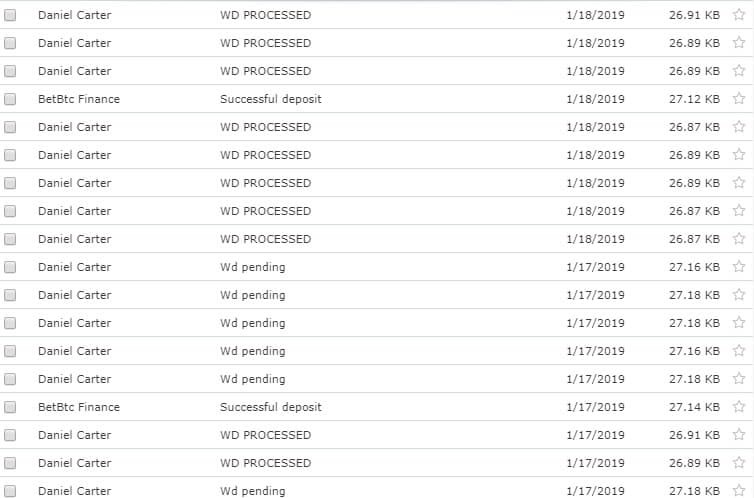 They were just hoping that I would lose back my winnings which is why they began with the stall tactics like requesting game logs, changing my monthly withdrawal limits ect.. There is no doubt in my mind that if I had lost most or all of my winnings back, that I would still have my account open and they would gladly be accepting my action. I mean think about everything that has transpired here and ask yourself what the most likely scenario is. Am I actually to believe that after all the back and forth I had with both the finance and the VIP department, that they never knew I was a US player? Of course not, they were trying every move in the book to keep me in pocket while not having to payout on the large win. You also have to ask yourself why a casino would take almost 3 weeks to lock the player's account if they were from a restricted country. Are we supposed to believe that they would process over 10 btc in withdrawals if they had a problem with the my ip being from the US? Of course not. As a matter of fact I've been told by actual online casino owners that they know within the first 30 seconds of a player signing up where they are from, are they potentially fraudulent, etc. So Betbtc.io knew all of this and chose to let me continue playing knowing it couldn't receive my payments. One of 2 things were going to happen. Either I was going to lose it all back and they would have a high roller player in pocket, or they would just deny my payouts in the end. Also think about what they would do if I had lost 180K euro. Do you really think they would send me an email saying hey, we decided to refund your deposits because you were playing from a country that is restricted to use our site? Of course not. So if you are a potential player and are thinking about signing up with Betbtc.io, please find another casino. I don't want to see anyone else screwed by this site. After looking at this situation, at the very least you have to agree that they use underhanded stall tactics and blatantly lied to their customer. That's not a site any player should be depositing real money to. I risked my money in good faith, and now they don't want to pay. It's as simple as that. Their actions and communication with me tell a very specific story that is hard to dispute. There is one more thing I want to mention. Their brand name Betbtc.io is almost the exact name as another popular bitcoin casino which actually has a good reputation. That site is Betbtc.co. So this is just another confirmation that they are running a total scam. They are basically riding the coat tails of a reputable casino in hopes that new players will be none the wiser thinking they are playing at a reputable site. It's a complete scam and Betbtc.io should be avoided at all costs. This is terrible. Thanks for the warning though. I will definitely not be signing up with them. This makes me sick to my stomach. It is a little bit of a sticky situation with the player being from the US. But with everything laid out here, it is very clear to me that this site is rogue in nearly every way casino can be. Hopefully this review will save at least some players from being potential victims and scammed by this site. Wow. I agree completely with your feelings on how so many casinos intentionally don’t block countries that they don’t allow in their terms. It’s a complete scam and sites like this should not be allowed to exist. Thank you very much for helping players such as myself avoid crooks like this. Its casinos like this that give the industry a bad name. Makes me sick that they scam people like this. I’m in a bunch of online gambling forums – and I’m telling everyone I can what they’ve done. Yea people need to be very careful with these crypto casinos. There are a lot that specifically target the crypto niche because they are crooks at heart and can hide the anonymity. Any casino that doesn’t display information about their licensing in a prominent way should raise red flags with any and all players. I got the same email trying to lure me in by the way. So I’m really thankful for your honest review. So I can tell you that you saved at least one player from getting shafted by them.